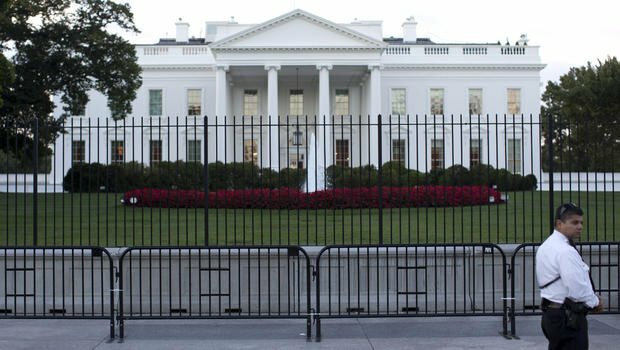 A second fence has been erected between the White House and a thoroughfare popular with tourists, local residents and workers, days after Omar Gonzalez scaled the main fence and entered the mansion through an unlocked door. The new barrier is a series of linked sections about 3.2ft high. Omar Gonzalez, 42, is being held in connection with September 19 intrusion. Authorities say the man was carrying a 3.5in knife and faces charges of unlawfully entering a restricted building carrying a “deadly or dangerous weapon”. Omar Gonzalez, an Iraq War veteran, was previously stopped by Virginia police in July. Officers found two powerful rifles, four handguns and other firearms and ammunition in Omar Gonzalez’s vehicle along with a map marking the White House. An unnamed federal law enforcement official told the Associated Press news agency Secret Service agents had interviewed Omar Gonzalez twice during the summer but concluded there was no evidence he was a security threat. A review of security was initiated by Secret Service director Julia Pierson, who also ordered “the immediate enhancement of officer patrols and surveillance capabilities” around the White House. Pennsylvania Avenue, which runs in front of the north facade of the White House, was closed to vehicular traffic in 1995 but remains highly popular with tourists as well as residents and office workers seeking a short cut through the parks surrounding the president’s home. Since September 19, Washington DC residents and media figures have angrily rejected the suggestion the Secret Service screen pedestrians and cyclists who want to enter the closed stretch of Pennsylvania Avenue or block it off entirely.